Every winter I tell myself that when the weather turns warm, I’m going to take advantage of it. I’m going to spend all my time outside, soaking up the warmth of the sun and enjoying the sounds and smells of spring. And then……reality hits! And all the things that have been occupying my time around the house all winter STILL need to be done….namely, cooking and cleaning! It’s amazing how much of my life I spend doing these two things, and how, at the end of the day, there’s always more of it to do. Which is why it’s important to just take a break sometimes and let someone else do the work! I recently did just that and made an easy meal with Stouffer’s Meat Lovers Lasagna and Texas Toast. It was a huge hit…..and couldn’t have been easier! 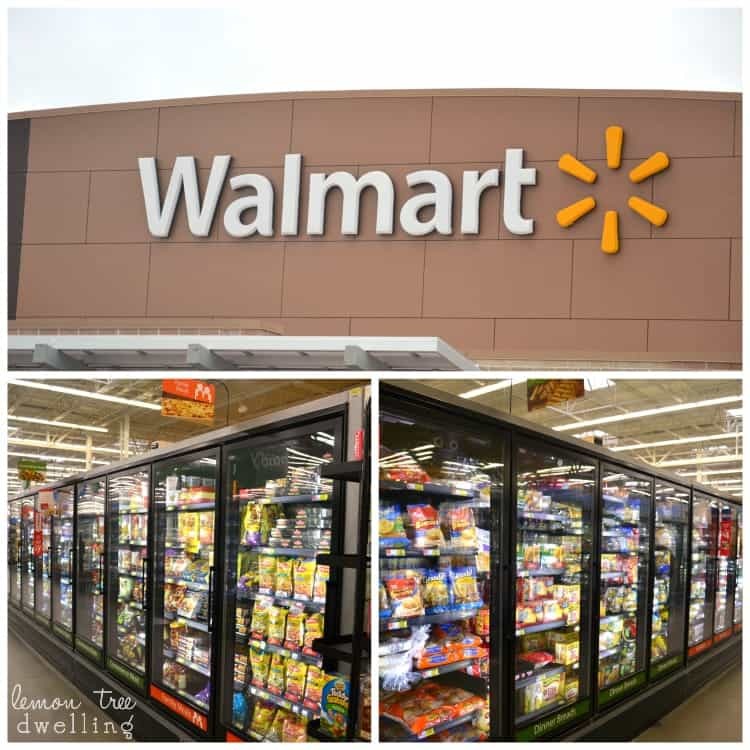 So when I found out that #CollectiveBias was partnering with Walmart to bring us some #NewFavorites from Stouffer’s, I was definitely intrigued. 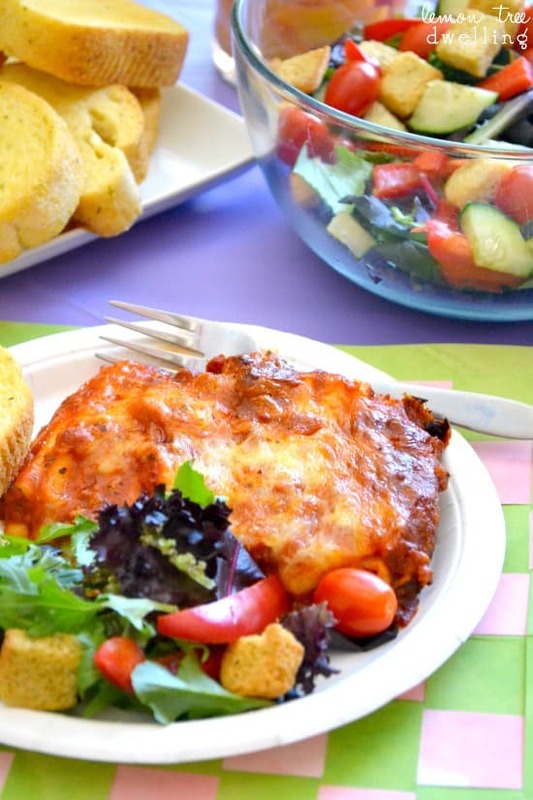 We love lasagna…but I don’t make it often because it always feels like such a commitment! 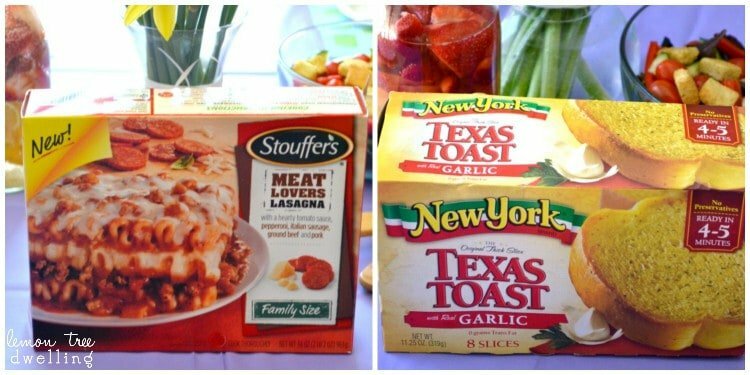 With Stouffer’s new Family Size Meat Lovers Lasagna and New York Texas Toast, you can have an easy meal, ready for your family in an hour. Without all the work! 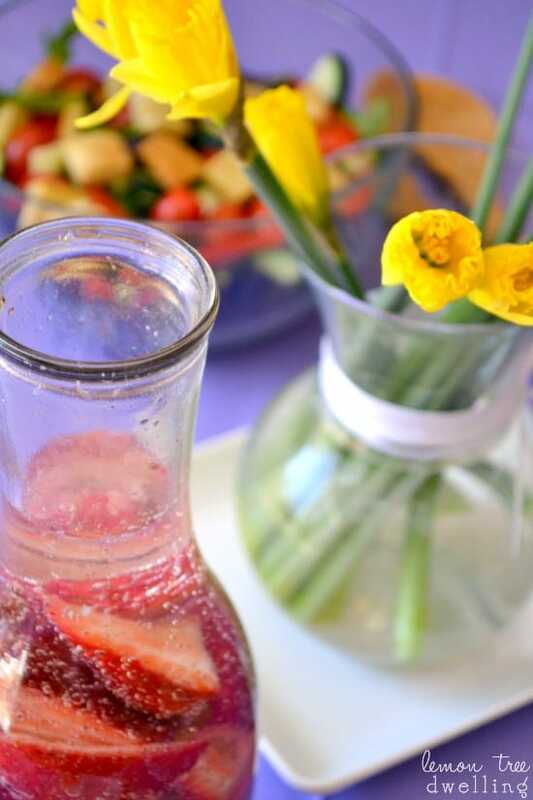 Of course, being the stubborn type, I couldn’t let them do ALL the work….so after picking up the lasagna and garlic toast at Walmart, I also picked up everything else I would need to whip up an easy salad and some fruit-infused sparkling water. I felt good about the fact that I was still doing SOMETHING, and my family felt good about the fact that they got to eat delicious lasagna and buttery garlic toast! A win-win! 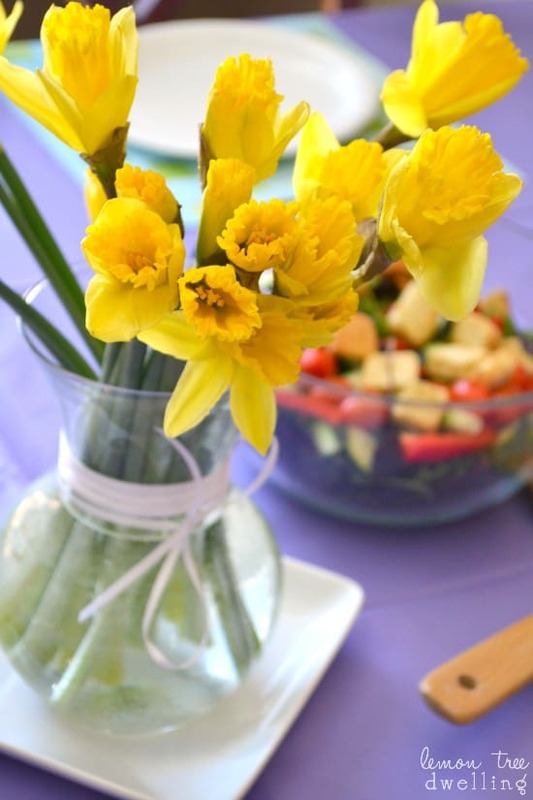 But the best part of all was the fact that easy dinner prep left me with more time to enjoy the beautiful spring weather we’ve been having….and teach the girls how to weave paper placemats! While dinner was in the oven, we sat and talked and wove colorful placemats to put on our easy spring table. A plastic tablecloth, paper plates, 5 placemats, and an hour later, we had a quick, easy, and delicious meal….and one that no one (not even I) could complain about! I’m all for quick and easy Cathy! 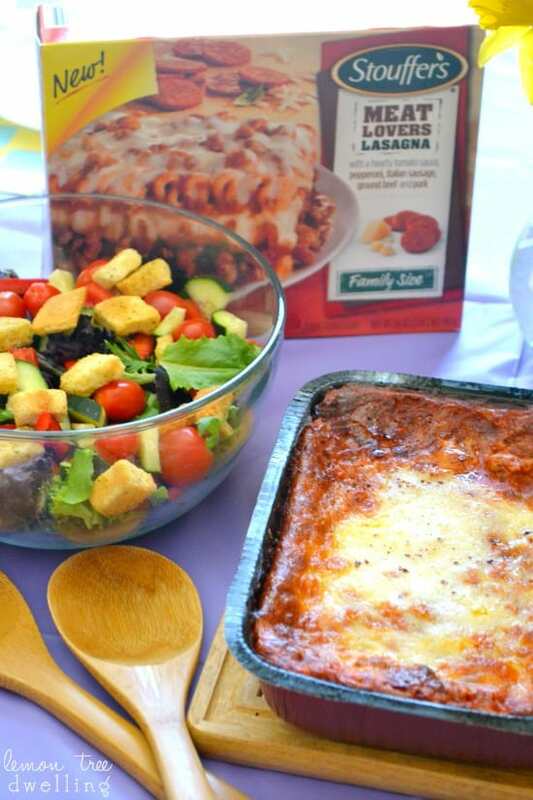 I love that Stouffers allows us busy Moms these options – plus, who doesn’t love a little Italian night every once and a while? Thanks for sharing! Yum!!! Enjoy the beautiful weather, Cathy!! !